You know all those studies that say married people live longer because you have someone to tell you to go to the doctor, eat nutritious food and just plain care about you? They’re all right, but I feel like they forgot an important element of marriage. Occasionally a person needs someone to tell them “Stop! What you’re doing is idiotic!” Whether it’s your husband about to snorkel with great white sharks or your wife taking the contents of the tool box to her feet. Today I got to be the stupid one. As a result of running and wearing too many impractical shoes, I’ve developed massive corns on the sides of my pinky toes. If this is too much information for some of my readers, just be grateful that you aren’t married to a doctor- Roscoe recites the intimate details of gunshot wounds over soup. The corns got so large last week that I decided to get some of those Doctor Scholl’s corn removers. Only I didn’t buy the Doctor Scholl’s kind. Roscoe is almost a doctor, which means we are still paying massive tuition fees every twelve months, so we eschew name brands in the name of not drowning in a tidal wave of red numbers. I digress, the corn removers shrunk my pinky toes so they could fit into my shoes again (Hurray!) but they also left giant, unsightly calluses. I’m many things; a weirdo, a hippie, a tiny, spastic dancer but I am not a woman who takes good care of her nails. As a result we do not have a nail file in our house. Mostly because when my nails grow long enough to be cut or filed I bite them. However these gigantic calluses were bothering me, so while Roscoe was searching for a cord to hook up my little netbook to the television, I decided to problem solve. Heading to the front hall closet, I pulled out Roscoe’s toolbox, reached in, tore a small square off a large sheet of sandpaper, then put the box and the remaining sandpaper back. Now I knew this wasn’t the best idea I’ve ever had, however my husband is becoming a doctor, so I figured that if using sand paper on my feet was really bad, he’d stop me. 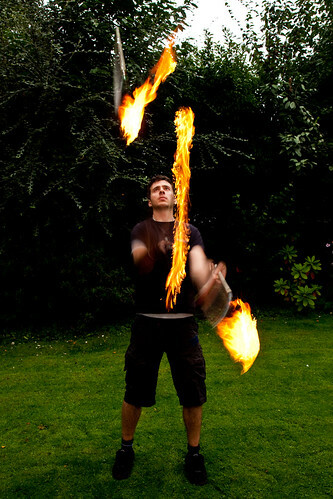 When a man makes the decision to juggle fire, somewhere after the first request “Honey? Do you know where I put my devil sticks?” but before heading out to the backyard with the blow torch, “We keep the lighter fluid in the garage right?” an alarm bell will go off in his wife’s head. A nosy “What are you up to?” from a concerned female will kibosh the whole idea pretty quick. So thanks to my marriage, I’m happy to announce my pinky toes are still intact. Roscoe is currently out purchasing a nail file.